K’nabiyaaxl/Ashdown Conservancy protects all of Ashdown Island, along with its surrounding islets, rocks and foreshore. Located within the Hecate Lowland and North Coast Fjords Ecosection, this rocky island supports important migratory bird winter habitat. The conservancy also protects an important Steller sea lion haul-out. K’nabiyaaxl/Ashdown Conservancy is only accessible by boat and is located about 40 km south of Hartley Bay and 120 km southwest of Kitimat. Ashdown Island is located at the south end of Whale Channel, between Princess Royal Island, Gil Island and Campania Island. Reference: Marine Chart #3724 (Caamano Sound and Approaches). Reference: 1:50,000 scale Topographic Map #103 H/3 (Gil Island). History: K’nabiyaaxl/Ashdown Conservancy was designated as a conservancy on July 14, 2006 following recommendations from the North Coast Land and Resource Management Plan. On February 13, 1950 an American B-36B “Peacemaker” bomber flying from Eielson Air Force Base near Fairbanks, Alaska to Fort Worth, Texas had three of its six engines catch fire. The crew bailed out over Princess Royal Island. The pilot was the last crewmember to bail out and landed in a shallow pond on Ashdown Island. The plane itself crashed on Mount Kologet in what is now Swan Lake/ Kispiox River Provincial Park. Cultural Heritage: The conservancy is in the asserted traditional territories of the Gitga’at and Gitxaala First Nations. Use the below link for more information or to contact these First Nations. Conservation: The conservancy protects a whole coastal island containing undisturbed old-growth forests of cedar and hemlock and coastal wildlife habitat, including the marine foreshore and intertidal areas. Wildlife: Steller sea lions haul-out on the unvegetated rocks 400 metres northeast of McNeill Point. Humpback whales, killer whales, Dall’s porpoises, Pacific white-sided dolphins and harbour seals can also be seen in the waters near Ashdown Island. The management plan for K’nabiyaaxl/Ashdown Conservancy was approved in December 2015. It is possible and permissible to SCUBA dive or snorkel in the conservancy. 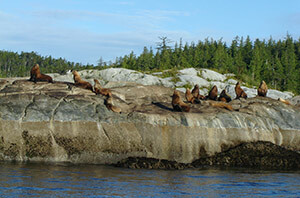 Steller sea lions haul-out on the unvegetated rocks 400 metres northeast of McNeill Point. Humpback whales, killer whales, Dall’s porpoises, Pacific white-sided dolphins and Harbour seals can also be seen in the waters near Ashdown Island.